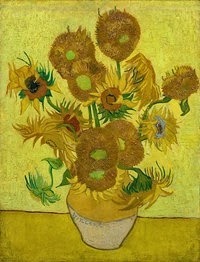 picture in the Van Gogh Museum. For the top public galleries, see: Best Art Museums. 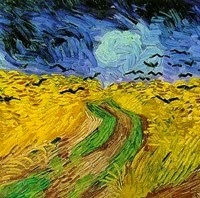 By Vincent Van Gogh (1888-89). One of the best art museums in Europe, the Van Gogh Museum is dedicated to the works of the 19th-century Dutch expressionist painter Vincent van Gogh (1853-1890). Opened in 1973 and located in the Museum quarter of Amsterdam, between the Rijksmuseum and the Stedelijk Museum, it receives almost 1.5 million visitors per year (2013), which makes it the 2nd most popular museum in the Netherlands, after the Rijksmuseum, and roughly the 35th most popular art museum in the world. In addition to works by Van Gogh, the museum's permanent collection also contains paintings by the artist's contemporaries, notably those associated with Impressionism (1873-90), Post-Impressionism in France (1880-1900), Pointillism (c.1884-1900), and Post-Impressionism in Holland (c.1880-1920), and stages exhibitions on various aspects of 19th Century art history. Other museums of fine art in the Netherlands include: Kroller-Muller Museum Otterlo (Gelderland), Museum Boijmans Van Beuningen (Rotterdam), the Rembrandt House Museum (Amsterdam) and Mauritshuis (The Hague). After the death of Vincent van Gogh in 1890, all his unsold paintings became the property of his brother Theo van Gogh, who died six months later, leaving everything to his widow, Johanna van Gogh-Bonger (1862-1925). Seeking to promote her brother-in-law's art, she sold a large number of the paintings and kept the rest as a private collection of her own. On her death in 1925, this collection went to her son Vincent Willem van Gogh, and was eventually transferred to the Vincent van Gogh Foundation, established by the state, in 1962. A new building was commissioned to house the collection, which opened to the public in 1973. As it is, the Van Gogh Museum occupies two buildings: the Rietveld building, designed by Gerrit Rietveld (1888-1964) of De Stijl, and the Kurokawa wing, designed in 1998-9 by the modernist architect Kisho Kurokawa (1934-2007) a founder of the Metabolist Movement. The new wing is devoted exclusively to temporary exhibitions. The permanent collection is displayed in the Rietveld building: the first floor showcases works by Van Gogh; the second floor is concerned with restoration and temporary art shows; while the third floor has paintings of Van Gogh's contemporaries. The museum's administrative offices are located on Stadhouderskade 55 in Amsterdam-Zuid. The Van Gogh Museum possesses the largest collection of Van Gogh's paintings and drawings in the world - a total of 200 paintings, 400 drawings, and 700 letters by the artist. Chronicling the various phases of Van Gogh's artistic life, the collection embraces landscape painting and portrait art, as well as numerous examples of genre painting and still life, plus a total of nine self-portraits. To see how Van Gogh's painting fits into the overall evolution of expressionism, see: History of Expressionist Painting (1880-1930). 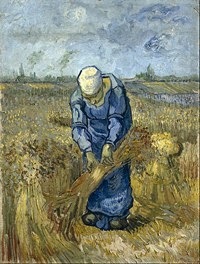 In addition, the collection contains works by a number of Van Gogh's contemporaries, including Impressionists like Camille Pissarro, Claude Monet, Edouard Manet, Edgar Degas and Gustave Caillebotte; exponents of Neo-Impressionism including Paul Signac and Georges Seurat; members of the Barbizon School like Charles-Francois Daubigny and Jean-Francois Millet; Symbolists like Odilon Redon; members of Les Nabis such as Edouard Vuillard and Maurice Denis; Post-Impressionist painters like Toulouse-Lautrec; members of the Pont-Aven school such as Paul Gauguin, Louis Anquetin, Emile Bernard; and the Dutchman Isaac Israels. There are also sculptures by Auguste Rodin and Jules Dalou. The collection also contains a number of self-portraits by the artist. - Johanna van Gogh-Bonger (1925) by Isaac Israels (1865-1934). - The Buddha (1904) by Odilon Redon (1840-1916). - Vincent Willem van Gogh (1894) by Isaac Israels. - The Supper at Emmaus (1894) by Maurice Denis (1870-1943). - The Mumps (1893) by Edouard Vuillard (1868-1940). - Woman at the Champs-Elysees by Night (1891) Louis Anquetin (1861-1932). - Moulin Rouge, La Goulue (cabaret poster) (1891) by Toulouse-Lautrec. - The Tub (1889) by Edgar Degas (1834-1917). - Vincent Van Gogh Painting Sunflowers (1888) by Paul Gauguin (1848-1903). - House Among Trees: Pont-Aven (1888) by Emile Bernard (1868-1941). - Railway Junction near Bois-Colombes (1886) by Paul Signac (1863-1935). - The Seine at Courbevoie (1884) by Georges Seurat (1859-91). - View Seen Through a Balcony (1880) by Gustave Caillebotte (1848-94). - Sunset at Villerville (1874) by Charles-Francois Daubigny (1817-78). - Route de Versailles, Rocquencourt (1871) by Camille Pissarro (1830-1903). - Windmills near Zaandam (1871) by Claude Monet (1840-1926). - The Jetty of Boulogne-sur-Mer (1868) by Edouard Manet (1832-83). - Girl Carrying Water (1865) by Jean-Francois Millet (1814-75). Rest of the year: Daily 9am until 5pm, Friday until 10pm.  For more about painting in the Netherlands, see: Homepage.